Line a baking tray with baking paper. Cut each salmon fillet in half crossways. Cut each half lengthways into 3 pieces. Place cornflakes in a bowl. Using hands, lightly crush. Add breadcrumbs. Stir to combine. Place flour on a plate. Whisk eggs in a shallow bowl. Coat 1 piece of salmon in flour, shaking off excess. Dip in egg. Toss in breadcrumb mixture, pressing to coat. Place on prepared tray. Repeat with remaining salmon pieces, flour, egg and breadcrumb mixture. Place potatoes in a large saucepan. Cover with cold water. Bring to the boil over medium-high heat. Boil for 10 to 12 minutes or until tender. Drain. Transfer to a bowl. Add butter and chives. Toss until butter has melted and coated the potatoes. Season with salt and pepper. Cover to keep warm. Meanwhile, heat vegetable oil in a large non-stick frying pan over medium-high heat. Cook salmon, in 2 batches, for 2 minutes each side or until golden. Transfer to a paper towel-lined plate to drain. Place lettuce, cucumber and avocado in a serving bowl. Whisk 2 tablespoons lime juice and olive oil together in a small bowl. Season with salt and pepper. Drizzle dressing over salad. Gently toss to combine. Place aioli, coriander and remaining lime juice in a small bowl. Stir until smooth. 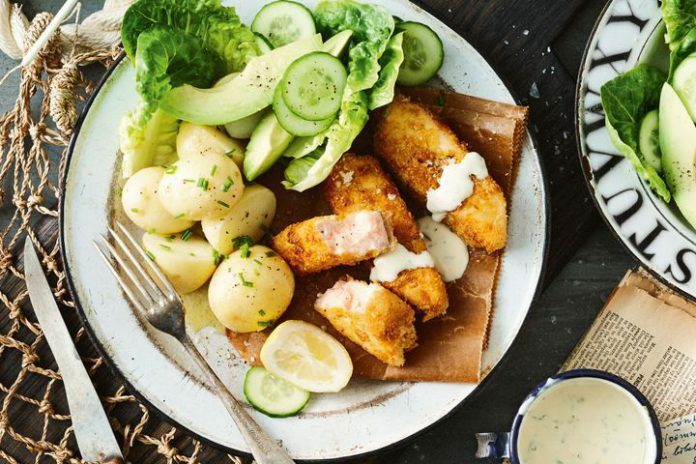 Serve salmon with salad, potatoes and aioli.